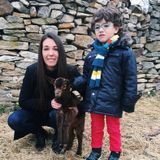 Hi there my name is Natalia, Im 24 and Im from Spain :)I love children, my little brother is 5 too. I'm capable caretaker who can't wait to help your family! I'm located in Yaletown Vancouver, near to the Skytrain and bus. I'm incredibly comfortable with meal preparation, travel support, and watering plants and I can start ASAP in a full time position.